I have moved to the University of Houston to start a tenure-track position at the Department of Computer Science. Here is my new webpage . I am looking for well motivated graduate students to work on various visualization research projects that will accelerate the knowledge discovery and help to make a better life. Hello, my name is Guoning Chen. I have started a Postdoctoral position at Scientific Computing and Imaging (SCI) institute at the University of Utah. My mentor is professor Chuck Hansen. At SCI, I am working on multiple projects. One is to develop efficient techniques for the analysis of toroidal magnetic fields for a SAP (Supplemental Application Partnership) project led by Allen Sanderson. I am also working on projects in geometric modeling, aiming to develop efficient algorithms to generate 2D and 3D meshes for visualization purpose and physically-based simulations. In the meantime, I continue working on vector and tensor field analysis and control for various data visualization and computer graphics tasks. Before joining SCI, I earned my Ph. D. degree in Computer Science from Oregon State University in 2009. My advisor was Dr. Eugene Zhang. During my PhD work, I had been working on vector field visualization, analysis, and design for scientific visualization and computer graphics applications. I am also interested in tensor field analysis and design, geometry modeling and processing, texture synthesis, and animation. I received a B.S. degree in Information and Communication in 1999 from Xi'an Jiaotong University and a M.S. degree in Control Theory and Engineering/Computer Application (advisor: professor Taoshen Li) in 2002 from Guangxi University in China. 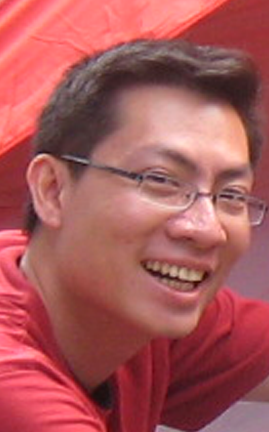 I worked as an instructor in the Computer Science department of Guangxi University from 2002 to 2004. Here is a version of my current CV in pdf. My research interests lie in scientific data visualization and computer graphics with emphasis on vector and tensor data analysis using topological-based methods for many engineering applications and various computer graphics tasks, such as, geometric modeling, geometry processing, non-photo-realistic rendering, computer animations, video editing, and digital arts. Vector fields are widely used to represent various dynamical systems that are involved in many important engineering applications, including computational fluid dynamics (CFD), automatic and aircraft design, mechanical engineering, climate study, oceanography, earthquake engineering, fusion science, and medical practice. Analyzing vector data stemming from these applications help the domain experts efficiently identify dynamics (or features) of interests, such as stagnant points and recirculating flows, that are critical for understanding the involving systems. I have worked with the domain scientists from the previously mentioned areas to help understand and present their large-scale and complex vector data. In the meantime, the features of interests that help characterize the vector fields are some sub-sets of the data, which are geometric in the nature. This allows us to develop efficient algorithms and interface to design and control these features to achieve the vector fields with desired behaviors. This processing is known as vector field design , an important tool for many important computer graphics tasks. 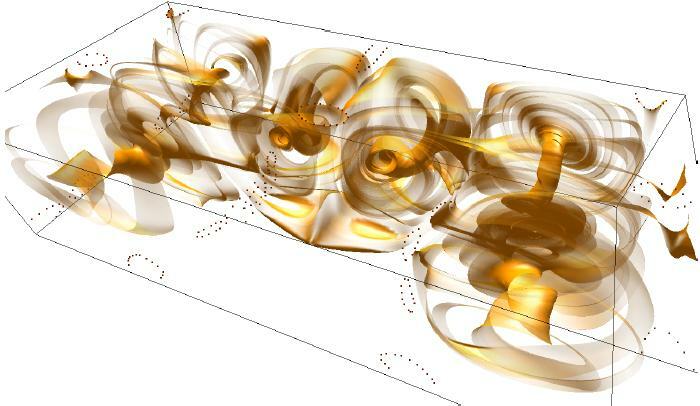 To that end, I have bridged my research topics in visualization and computer graphics with an effective methodology, that is, the results of the analysis of (vector) fields can be applied to devise effective means to control and model them. In addition, many other more complex data, such as tensor and higher-order tensor fields, can be decomposed or converted to some sorts of vector fields during analysis. For instance, the analysis of tensor fields can be partially accomplished through the analysis of their corresponding eigen-vector fields. 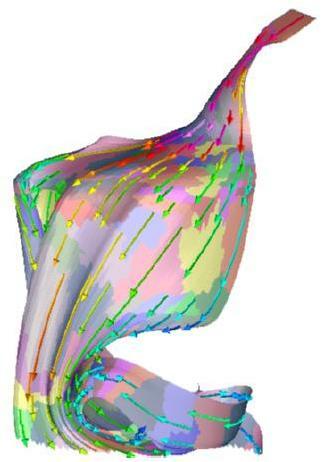 Therefore, the analysis of vector fields provides the foundation for understanding more complex data. In the near future, I would like to extend my existing work on 2D steady vector data analysis and control to more complex settings, such as 3D, time-dependent (i.e. unsteady), or tensor and higher-order tensor data. I will also look forward to addressing emerging visualization and computer graphics problems with more challenging requirements. Tobias Martin, Guoning Chen, Suraj Musuvathy, Elaine Cohen, and Charles Hansen. "Generalized Swept Mid-Structure for Polygonal Models". EuroGraphics 2012 (to appear), Italy [pdf][mov ]. Jin Huang, Wenjie Pei, Chunfeng Wen, Guoning Chen, Wei Chen, and Hujun Bao. "Output-Coherent Image-Space LIC for Surface Flow Visualization". IEEE Pacific Visualization Symposium 2012 (to appear), Korea [pdf]. Guoning Chen, Vivek Kwatra, Li-Yi Wei, Charles Hansen, and Eugene Zhang, "Design of 2D Time-Varying Vector Fields", IEEE Transactions on Visualization and Computer Graphics, to appear, 2011 [pdf] [Project webpage]. Harsh Bhatia, Shreeraj Jadhav, Peer-Timo Bremer, Guoning Chen, Joshua A. Levine, Luis Gustavo Nonato, and Valerio Pascucci. "Flow Visualization with Quantified Spatial and Temporal Errors using Edge Maps", IEEE Transactions on Visualization and Computer Graphics, 2011, to appear [pdf]. Guoning Chen, Darrel Palke, Zhongzang Lin, Harry Yeh, Paul Vincent, Robert S. Laramee and Eugene Zhang. "Asymmetric Tensor Field Visualization for Surfaces", IEEE TVCG (Proceeding of IEEE Visualization 2011), Vol.17, No. 12, pp 1979-1988, 2011 [pdf][mov]. Wieland Reich, Dominic Schneider, Christian Heine, Alexander Wiebel, Guoning Chen, Gerik Scheuermann. 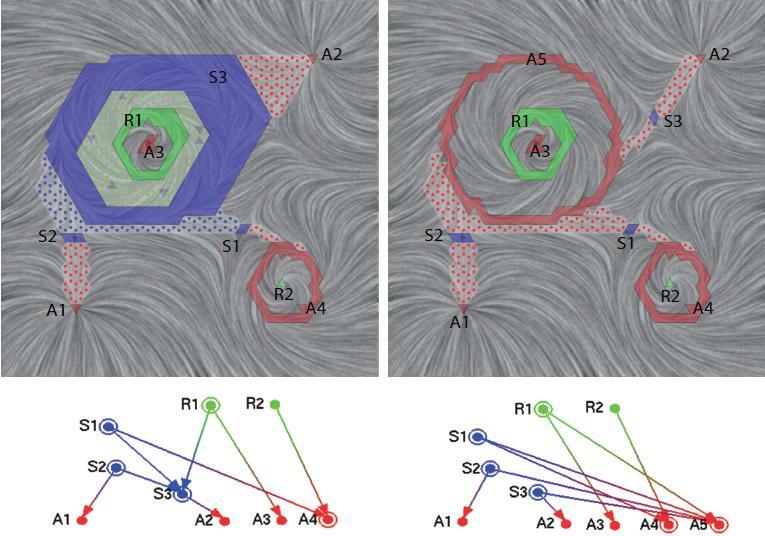 "Combinatorial Vector Field Topology in 3 Dimensions", TopoInVis2011, April 4-6, 2011, Zurich, Switzerland [pdf]. Allen Sanderson, Guoning Chen, Xavier Tricoche, and Elaine Cohen. "Understanding Quasi-Periodic Fieldlines and Their Topology in Toroidal Magnetic Fields", TopoInVis2011, April 4-6, 2011, Zurich, Switzerland [pdf]. Matt Edmunds, Tony McLoughlin, Robert S. Laramee, Guoning Chen, Eugene Zhang, and Nelson Max. "Automatic Stream Surface Seeding", EUROGRAPHICS 2011 Short Papers, pages 53-56, 11-15 April 2011, Llandudno, Wales [pdf]. Guoning Chen, Qingqing Deng, Andrzej Szymczak, Robert S. Laramee, and Eugene Zhang. "Morse Set Classification and Hierarchical Refinement using Conley Index", IEEE Transactions on Visualization and Computer Graphics, 2011,to appear [pdf] [demo program]. Zhenmin Peng, Edward Grundy, Robert S. Laramee, Guoning Chen, and Nick Croft. "Mesh-Driven Vector Field Clustering and Visualization: An Image-Based Approach", IEEE Transactions on Visualization and Computer Graphics, 2011, to appear [pdf]. Allen R. Sanderson, Guoning Chen, Xavier Tricoche, David Pugmire, Scott Kruger, and Joshua Breslau. "Analysis of Recurrent Patterns in Toroidal Magnetic Fields". IEEE Transactions on Visualization and Computer Graphics, Vol. 16, No. 4, 2010, pp.1431-1440 [pdf]. Guoning Chen, Konstantin Mischaikow, Vivek Kwatra, and Eugene Zhang. "Time-Varying Vector Field Design on Surfaces". Technical Report (EECS), Oregon State University, May 2009. URL: http://hdl.handle.net/1957/11507. A version submitted to TVCG can be found here. Benjamin Spencer, Robert S. Laramee, Guoning Chen, and Eugene Zhang. 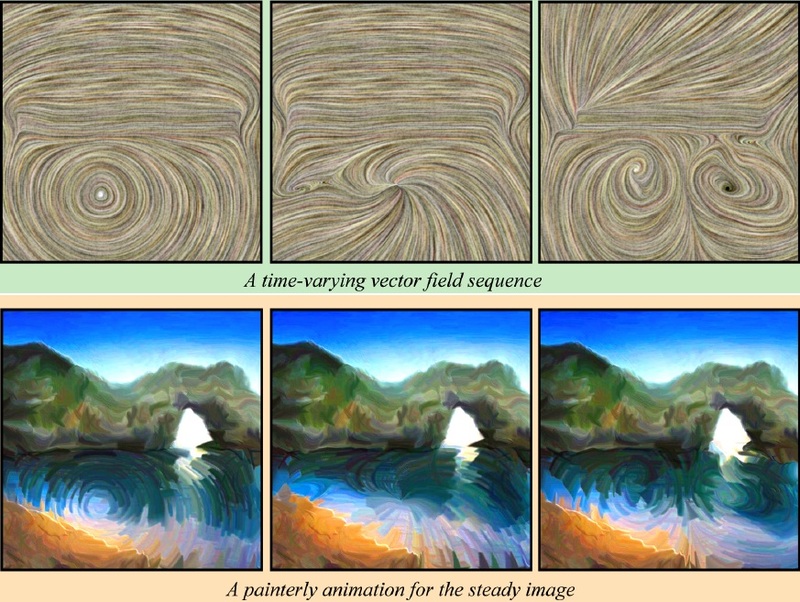 "Evenly-Spaced Streamlines for Surfaces: An Image-Based Approach", in Computer Graphics Forum 2009, Vol. 28(6), 2009, pp. 1618-1631. Guoning Chen, Gregory Esch, Peter Wonka, Pascal Mueller and Eugene Zhang. "Interactive Procedural Street Modeling". ACM Transaction on Graphics 27 (3) ( SIGGRAPH 2008). [Project webpage][Paper pdf][Talk slides (pptx), (pdf)]. Guoning Chen, Konstantin Mischaikow, Robert S. Laramee, and Eugene Zhang. "Efficient Morse Decompositions of Vector Fields". IEEE Transactions on Visualization and Computer Graphics, Vol. 14, No. 4, 2008, pp. 848-862. [Technical Report][Project webpage] [Talk slides in KAV07 workshop][demo program ]. Guoning Chen, Konstantin Mischaikow, Robert S. Laramee, Pawel Pilarczyk, and Eugene Zhang. 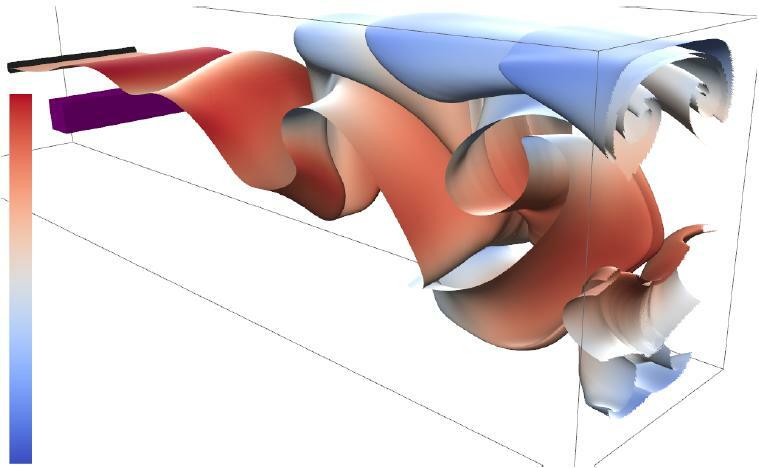 "Vector Field Editing and Periodic Orbit Extraction Using Morse Decomposition". IEEE Transactions on Visualization and Computer Graphics, Vol. 13, No. 4, 2007, pp. 769-785. [Project webpage] [Technical Report] [demo program ]. Tony McLoughlin, Matthew Edmunds, Robert S. Laramee, Mark W. Jones, Guoning Chen, and Eugene Zhang. 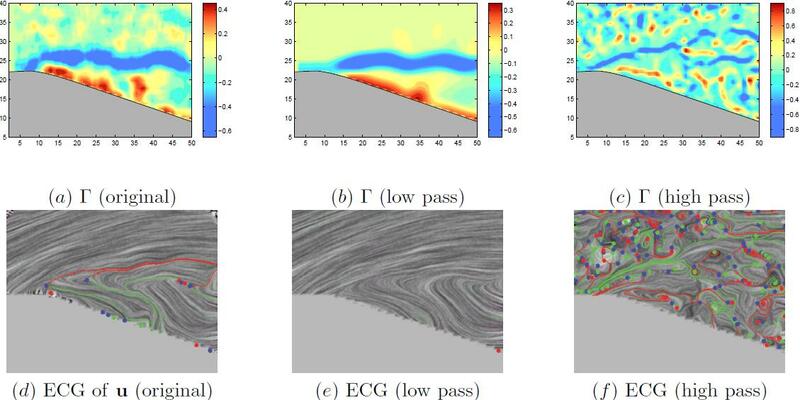 "Using Integral Surfaces to Visualize CFD Simulation Results", NAFEMS World Congress (NWC) Conference Proceedings, The International Association for the Engineering Analysis Community, 23-26 May 2011, Boston, Massachusetts [pdf]. Zhenmin Peng, Robert S. Laramee, Guoning Chen, and Eugene Zhang, "Glyph and Streamline Placement Algorithms for CFD Simulation Data", NAFEMS World Congress (NWC) Conference Proceedings, The International Association for the Engineering Analysis Community, June 16-19, 2009, Crete, Greece [pdf ]. Stephen Snider, Daniel Morse, Guoning Chen, Sourabh V. Apte, James A. Liburdy and Eugene Zhang. 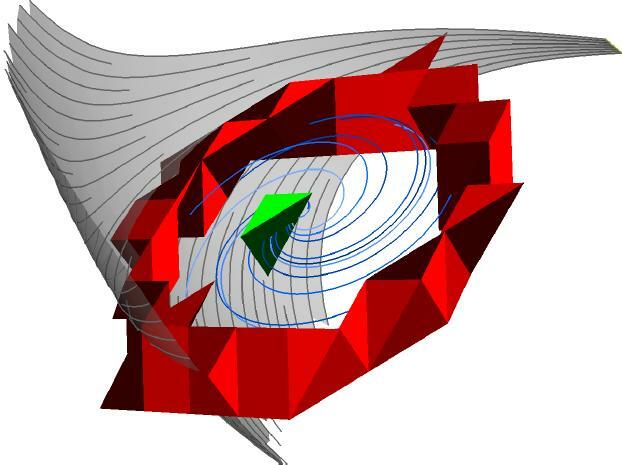 "Detection and Analysis of Separated Flow Induced Vortical Structures ". 46th AIAA Aerospace Sciences Meeting and Exhibit, January 2008, Reno, Nevada, AIAA 2008-361. Guoning Chen, Robert S. Laramee, and Eugene Zhang. 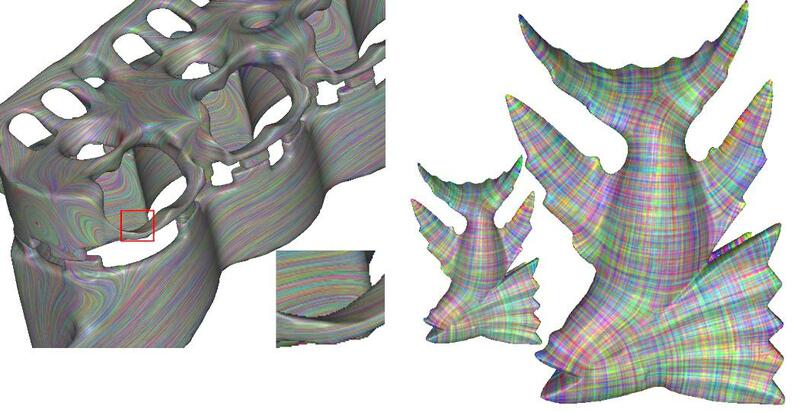 "Advanced visualization of Engine Simulation Data Using Texture Synthesis and Topological Analysis". NAFEMS World Congress 2007. [Pdf][Talk slides (ppt)]. 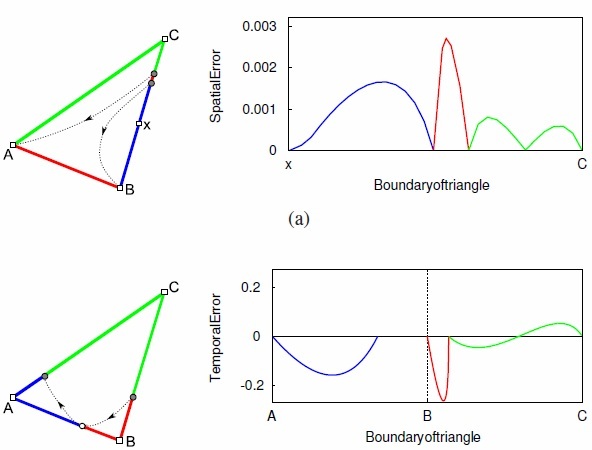 Topological Analysis, Visualization, and Design of 2D Vector Fields, Advisor: Dr. Eugene Zhang, Oregon State University, 2009 [URL]. Tao-Shen Li, Ting Han, Guo-Ning Chen, "XML Query Based on Ontology". Journal of The IEEE Intelligent Informatics Bulletin, Vol.6, No.2, 2005 Nov: 8-13. WU Yi-hui, CHEN Guo-ning, QIU Lu-wen, and LI Zhou-hua, "A multi-version approach to solve conflict problem in distributed graphics collaborative editing systems".Journal of Guangxi University(Natural Science Edition), 2005, S2 (in Chinese). Chen Guo-ning, LI Tao-shen. "The Research of theCorrectness Criterion for the Execution of Transactions inHierarchicalMulti-database". Journal of Computer Engineering, Vol.31, No.6. 2005: 52-55. Chen Guoning, Li Taoshen, Liao Guoqiong. "A Multi-granularity Locking Protocol Based on Ordered Sharing Locks in Engineering Databases that Supports Cooperative Design". 2004 International Symposium on Distributed Computing and Applications to Business, Engineering and Science, Wuhan, Hubei, China, September 12~16, 2004. Guoning Chen, Taoshen Li. "Extended Chain-Conflicting Serializability for the Correct Schedule of Transactions in Hierarchical Multidatabase". The Fifth International Conference on Web-Age Information Management, 15-17 July, 2004, Dalian, China, 658-663. Chen Guoning, Li Taoshen. "A Modeling Method for Cooperative Designing Procedure in CSCD Environment and its Application". Journal of Guangxi Academy of Science. 2004, Vol.20, No.2: 68-72 (in Chinese). Chen Guoning, Li Taoshen, Liao Guoqiong. "A Recovery Method Based on Save-point Mechanism and Log for Cooperative Design Transactions". Journal of Computer engineering. 2004, Vol.30, No.9: 58-60 (in Chinese). Chen Guoning, Li Taoshen, Liao Guoqiong. "A Timeout-trigger Two-phase Commit Protocol of Engineering Design Transactions". Computer Engineering and Applications. 2004, Vol.40, No.14: 178-180, 195 (in Chinese). Guoning Chen, Taoshen Li and Guoqiong Liao, "Commit Mechanism of Engineering Database Supporting Cooperative Design Transaction". International Symposium of Future Software Technology (ISFST'2002). Oct. 23-25, 2002, Wuhan, P.R.China. Chen Guoning, Chen Qiulian, Li Taoshen, Wu Heng, Zhou Dong. "The Design of a Graphic CAD System based on ObjectARX for Supporting System of Deep Excavations". Computer Engineering and Applications. vol.38, 2002(18): 229-230,241 (in Chinese). Li Taoshen, Liao Guoqiong, and Chen Guoning, "Transaction Management Mechanisms in Distributed Engineering Database System". Proceeding of the Seventh International Conference on Computer Aided Design and Computer Graphics. August 22-24, 2001, Kunming, China, p.785-790. Li Taoshen, Liao Guoqiong, and Chen Guoning, "Research on Technology of Transaction Management mechanism in Distributed Engineering Database System". Journal of Guangxi Science, 2001, 8(3): 172-176 (in Chinese). Chen Guoning, Chen Qiulian, and Li Taoshen, "The Design of Traditional Chinese Medical diagnosis for Cough Expert System". Journal of Guangxi University (Nat Sci Ed), Vol.26, 2001(2): 101-104 (in Chinese).